With the advent of technology life is becoming more digital. Everything around us, from TV to mobile phones is a testimony to that. And one of the most prominent members of this two-digit league is the digital camera. A true descendant of the box and the Polaroid camera, digital camera was a runaway hit when first introduced and after a series of evolution has now become a must-have gadget. There's a reason why practically everybody you know has a digital camera - they're compact, value for money, easy to use and versatile. Take digital photos with a trend setting camera that has innovative features and technology that looks cool. Small enough to fit in your pocket, yet stylish enough to take anywhere! When it comes to buying digital cameras, one trusted name that instantly creeps into our mind is Sony, the reigning brand in the world of electronics. Sony showcases a wide range of sleek digital cameras with cutting edge technology and competitive price in the local outlets to choose from. Based on the mega pixel and LCD display size, different Sony digital cameras come with different price tags. The Sony Cyber-shot DSC-T100 features an 8 megapixel sensor which is coupled to a Zeiss 5x optical zoom and a large 3” LCD display. Stylish, ultra compact, and sophisticated the T100 is just a bit taller and wider than a credit card, but it's about as thick as a deck of playing cards. It is priced at Tk 35,990. 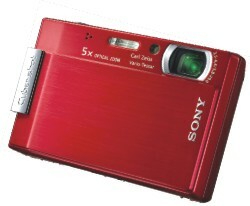 While not as tiny as models in Sony's T-series, the Sony Cyber-shot W200 is still quite small and pocket-friendly, and boasts an impressive 12.1 megapixel CCD in its small body. Sleek and attractive, the Sony W200 is an eye-catcher with its silver brushed-metal front and shiny silver accents for only Tk 31,990. Another member of W series is the DSC-W90 featuring an 8 megapixel sensor which is coupled to a Zeiss-branded 3x optical zoom and a 2.5" LCD display. It is priced at Tk 29,990. The DSCW35, a bit inferior than W90 has a 7.2 megapixel sensor and a 2.0” LCD display with a 3x zoom and hence it costs Tk 18,990 only. Almost all of these models include Sony's new face detection technology, capable of detecting up to eight faces simultaneously and each of them has a one-year warranty. A few things to keep in mind while buying a digital camera. Megapixels are not everything, but the quality of the megapixels matters as well. Concentrate on optical not digital zoom and also opt for maximum storage capacity. And be sure to buy it from an authorized dealer for valid warranty. Well now, as the tourism season is coming up, it's time to retire that old film camera and be a part of the trend with a compact digital camera that goes everywhere you go!